"Before EZ ICE, hockey dads would waste entire weekends pounding stakes into the ground. Our stake-less EZ ICE rink is so simple my kids can install it!" stakes into the ground. Our stake-less EZ ICE rink is so simple my kids can install it! waste entire weekends pounding stakes into the ground. Our stake-less EZ ICE rink is so simple my kids can install it!" 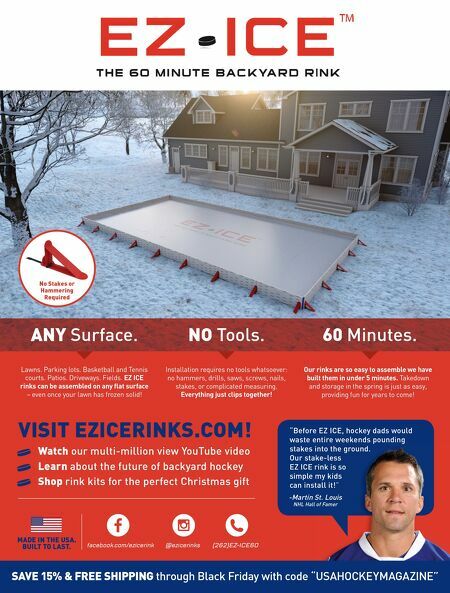 -Martin St. Louis NHL Hall of Famer SAVE 15% & FREE SHIPPING through Black Friday with code "USAHOCKEYMAGAZINE" Watch our multi-million view YouTube video Learn about the future of backyard hockey Shop rink kits for the perfect Christmas gift VISIT EZICERINKS.COM! No Stakes or Hammering Required facebook.com/ezicerink @ezicerinks (262)EZ-ICE60 MADE IN THE USA. BUILT TO LAST. NO Tools. Installation requires no tools whatsoever: no hammers, drills, saws, screws, nails, stakes, or complicated measuring. Everything just clips together! ANY Surface. Lawns. Parking lots. Basketball and Tennis courts. Patios. Driveways. Fields. EZ ICE rinks can be assembled on any fl at surface – even once your lawn has frozen solid! 60 Minutes. Our rinks are so easy to assemble we have built them in under 5 minutes. Takedown and storage in the spring is just as easy, providing fun for years to come!